To be the builder of choice in South Gippsland. We want to make your building experience enjoyable at an affordable price. Steve Vuillermin and Brent Casbolt together are South Gippsland Homes. Both professional builders have long lived and worked in South Gippsland and have well in excess of 50 years’ experience between them, having built houses from Wonthaggi to Inverloch, Tarwin Lower to Venus Bay, Foster to Yarram, Sandy Point to Fish Creek, Leongatha to Korumburra, Phillip Island to San Remo and Kilcunda. At South Gippsland Homes we pride ourselves on using only professional local builders and trades to look after our clients wherever they are and whatever the size of the project. Offering over 25 different designs, each with a number of options and all with at least 6 star energy ratings. South Gippsland Homes offers some exciting packaged homes. If you want to make your design more individual to reflect you and your personality, we can cater for this in house utilising our own design team. Building in anything from bricks to weatherboards and everything in-between we also supply a special builders range of bricks, tiles, plumbing fixtures and fittings, appliances, floor coverings, plus our clients receive a complimentary design consultation. The Victorian government has introduced a new 6 Star energy rating system for residential housing. From July 2004, all new homes in Victoria must achieve a 6 Star rating. Six Star does not apply to renovations or alterations to existing homes. However, existing homes can benefit from incorporating energy efficient design features, which will lead to energy and cost savings. The 6 Star rating is flexible and can be achieved using a range of energy efficient design features. Building, design and construction professionals, South Gippsland Homes can advise you on how you can meet the 6 Star standard. An accredited house energy rater can also help you achieve 6 Stars. 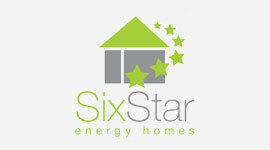 Six Star homes are more affordable and save their owners around $210 per year* on energy bills. If you have central heating or air conditioning or you have a large home you can save even more. Even without using any heating or cooling, 6 Star homes are up to five degrees warmer in winter and up to ten degrees cooler in summer than the average (2 Star) new home. The house is designed to reduce greenhouse gas emissions, save water and energy and reduce waste during construction and the house’s lifetime. The house is designed to prevent injuries through built-in safety features. It has security elements to reduce crime and improve the occupants’ sense of security. Features are also used to provide flexibility and comfort for people of varying abilities and at different life stages, including children and people with limited mobility. The house is designed to save money during construction and over the lifetime of the house. Careful planning avoids the need for major future renovations and reduces costs associated with energy use, water use and maintenance.